Here’s another of our favourite working-week-night meals. 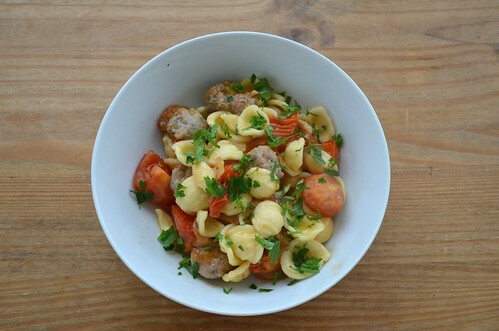 A simplified spaghetti and meatballs, if you like. It’s lighter than that, though, and more summery. And if you choose the spring onion version of the dish, it can be on the table in a super speedy 20 mins. When we’re not short on time, I prefer to make the version with the sautéed onions. The sweetness adds a bit more depth to the sauce, I find. If you using the onion, heat a couple of tablespoons in a frying pan (not a wee one – the sauce will be made in this) over a medium heat and gently fry the onions for 20 mins or so until golden. Remove to a bowl with a slotted spoon. 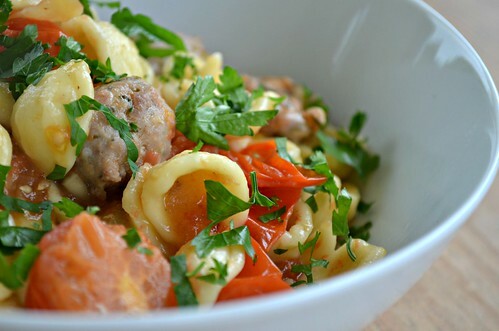 Remove the sausage meat from the skins and roll into small balls – bigger than a marble, smaller than a golf ball. Using the same oil the onions were cooked in, fry the meatballs over a high heat for 3/4 minutes until browned on all sides. At the point, I like to pour the excess oil out of the pan. Add the onion back to the pan and a good splash of wine. 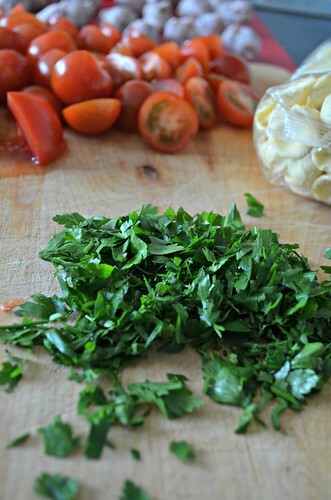 Cook for a minute to burn off the alcohol reduce the heat to medium then add the cherry tomatoes and basil to the pan. Stir frequently and reduce the heat further once the tomatoes start to break down. Meanwhile, bring a large pan of salted water to the boil. Add the pasta to the salted water and cook according to instructions. Drain the pasta and toss with the sauce and (if using) spring onion. Serve topped with chopped parsley or a handful of rocket. Pasta is perfect after a day’s work …. or even a very lazy day . The cherry tomatoes are excellent this year , too . Looks wonderful! I’ll definitely be making!